Rainwater is an excellent source of drinking water whether you’re living on a homestead or surviving after a disaster. However, it’s not as simple as setting out buckets when it rains. 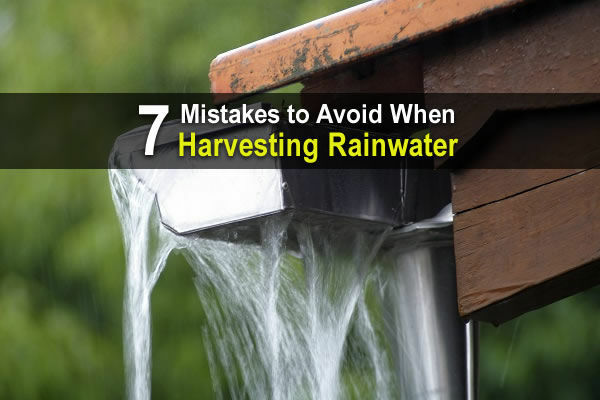 You need to set up a proper rainwater harvesting system. And even then, you have to be careful not to make any serious mistakes. Look over this list of mistakes and make sure you’re not making them or you’ll live to regret it. Forgetting to make sure it’s legal in your area. Using the wrong kind of barrel (the wrong kind will leach dangerous chemicals into your water). Buying expensive barrels. If you’re search hard enough, you can find them used. Not setting up a system for getting your water out (such as a spigot or pump). Not keeping your barrels covered (with sheets, screens, or even cooking oil). Forgetting to let rain rinse your roof for 10 minutes before collecting rainwater. Using a small system. It takes a lot of water to live. I can add one more from my morning. Don’t use your basement to store rain water. Which we appear to be doing today. Oh no. We did a little bit too.